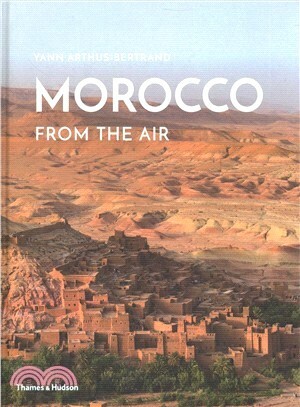 Seen from the sky, Morocco seems to be a vast chain of mountains, gradually lowering to the sea. The country’s rich farmlands – seen here in Arthus-Bertrand’s transcendent photographs as abstract canvases painted in deep yellow saffron, or as brown fields of wheat combined with the brilliant green of large groves of palm and olive – are breathtakingly beautiful when viewed from above. The sky over Morocco is of an unusually vivid blue, the mountains are crowned by snow peaks in winter, and the Mediterranean and Atlantic coastlines draw sun worshippers from all of Europe as soon as cold weather strikes the Continent. In Marrakech is concentrated all the culture of the south. Here is a city of a thousand and one nights, its streets teeming by day with magicians, fakirs and clowns, its luxurious palaces and hotels glistening at night with the multilingual babble of elegant visitors from abroad. In Fez, the intellectual centre of the north, are some of the most beautiful Islamic monuments in the world.